Both partners of Broadland Tree Services are members of the Arboricultural Association and the Royal Forestry Society, regularly attending conferences, courses and visits. All aspects of tree work conform to B.S. 3998 (2010). All of our staff carry the relevant industry recognised and H.S.E. required qualifications/certificates, these include N.P.T.C.‘s, I.P.A.F. and First Aid Certificates; LANTRA Level 3 for Professional Tree Inspection is held by Phil Anderson. All staff are provided with appropriate training where necessary and both partners keep abreast of developments in the industry through continual professional development both in the U.K. and abroad. 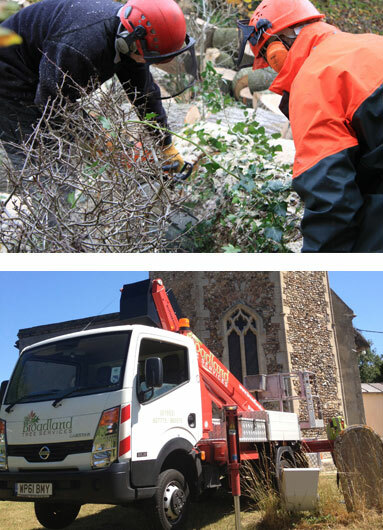 Broadland Tree Services is fully insured: we carry up to £5,000,000 Public Liability Insurance, £10,000,000 Employers Liability Insurance and £500,000 Professional Indemnity Insurance. We produce Risk Assessments and Method Statements as required and carry a Health and Safety Policy, Quality Policy, Training Policy and Environmental Policy all of which are reviewed on an annual basis. All waste & by-products arising from our operations, if not retained by our clients are disposed of in an environmentally responsible manner. We carry an appropriate Waste Carrier Certificate issued by the Environment Agency.